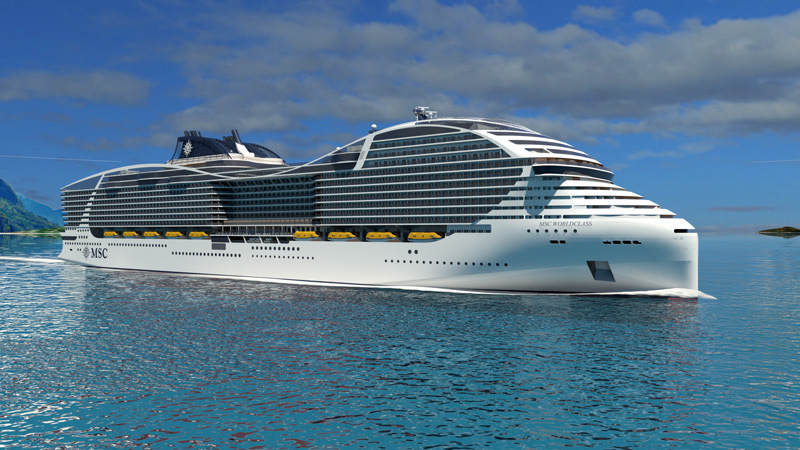 MSC Cruises has now confirmed their order for up to four LNG-powered cruise ships of 200,000gt at STX France and released the first rendering of their new design. The delivery schedule is 2022 and 2024, with the options in 2025 and 2026. Each ship will have 2,760 staterooms and accommodate up to 6,850 passengers—the highest capacity of any cruise ship. Other innovations include family-friendly ‘villages,’ a panoramic aft and a glass pool lounge. Malcolm says: Wow, she certainly looks original from the front, although the rear split superstructure is of course RCI Oasis style. The thought of 6,850 passengers will scare many people. That’s around 554 more passengers than RCI’s ‘Oasis’ class, the world’s biggest cruise ship, yet the ‘World Class’ will be some 25,000 gross tonnes (12.5 per cent) smaller. She sounds ‘busy’! One of her innovations is a ‘square’ cabin design. We have yet to see the renderings of the cabins. This entry was posted on June 1, 2017 at 10:08 am and is filed under Cruising, MSC (Mediterranean Shipping company). You can follow any responses to this entry through the RSS 2.0 feed. You can leave a response, or trackback from your own site. 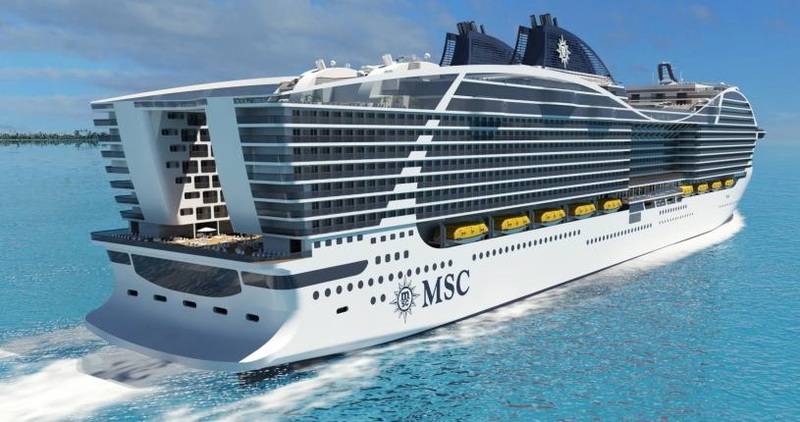 Ordering ships and commissioning artists renderings is the easy part – MSC simply don’t have the culture to compete with RCCI or Carnival as a leisure provider. Paul see my added images – The ‘World Class’ might be regarded as an imitation of the ‘Oasis class’. Meraviglia seems to me A cheap imitation of RCI’s Quantum class with A promenade à la Voyager thrown in. Seaside : that is new and different. But with with World Class we are back to the big bulky ships that offer little connection with the sea. Theorie fleet plan Lack consistency. I was on Fantasia in March. The ship was fully booked and it felt already too crowded.